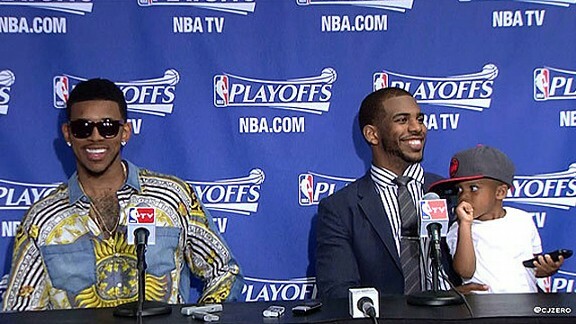 After the Clippers’ win over the Memphis Grizzlies on Monday night, Chris Paul asked Nick Young and Nick Young’s shirt to accompany him to the postgame press conference and hang until Blake Griffin was done primping. 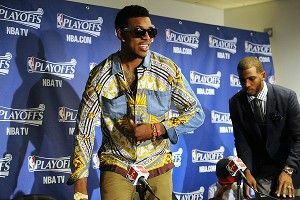 Swaggy P listened, sat in Blake’s seat, and proceeded to let the star of this show, his shirt, provide laughs for Chris, the reporters, and anyone with an Internet connection. Everyone seems to be all smiles, but if you look closely, one person just isn’t participating in the yakfest like the rest. Christopher Emmanuel Paul II, age 2. A guy called Swaggy P is cooler than my dad. Since Paul the Second was born, his father has been something of a suited-up fashion staple in the NBA community. So, day in and day out, young Christopher sees his dad looking quite suave and put-together. Up until this point, that’s everything he knew. But then Monday night happened and this Omarion-looking creature walks in wearing an Aztec dashiki, and suddenly Paul the Second’s entire world is turned upside down. The shocked stare he’s giving Swaggy says it all. It screams “Swaggy. Be my Daddy.” And, to make matters worse: (1) Paul the First has no clue he’s just lost his son to Swaggy P, and (2) neither Nick Young nor Swaggy P have any business raising this child. WHAT IS HE DOING ON THAT IPHONE? I BET IT’S NOT DRAWING. TEN BUCKS HE IS ON ZILLOW LOOKING UP HOW MUCH NICK YOUNG’S HOUSE IS WORTH. THIS IS SO BAD. What started out as a fun opportunity to crack jokes with the media has now turned into one of the worst decisions of Paul the First’s life. This is bigger than basketball. This is his family. This is his son. My advice to Paul the First: Ditch the suit. Find out the name of the blouse shop that Nick frequents and buy everything. This will both give you all of the clothes that your son obviously respects and keep other articles of clothing out of the hands of the Swaggy. Yes, this might cost you a pretty penny, but if you truly care about your heir to the throne, you’ll stop at nothing. Don’t lose your son to Swaggy P.